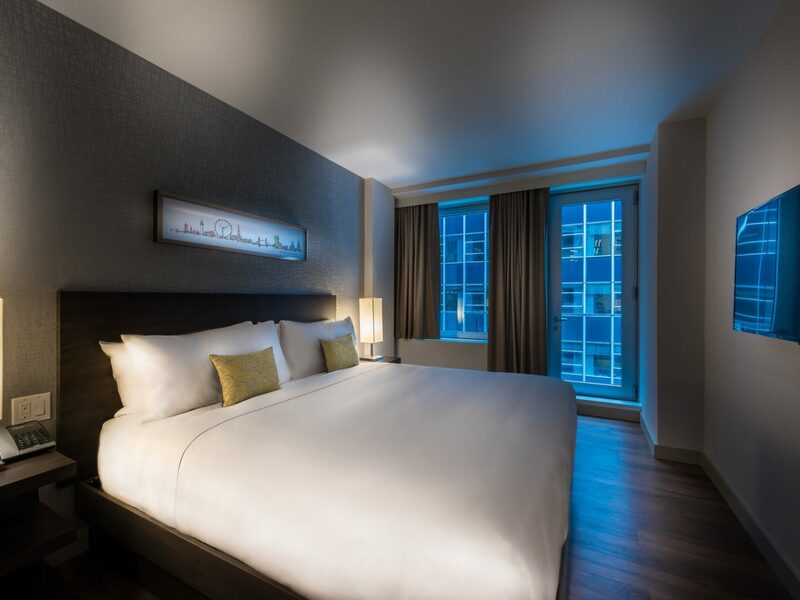 Yes, it is possible to find a reasonable place to bed down in the most expensive city in America—without compromising on style, scene, or location. 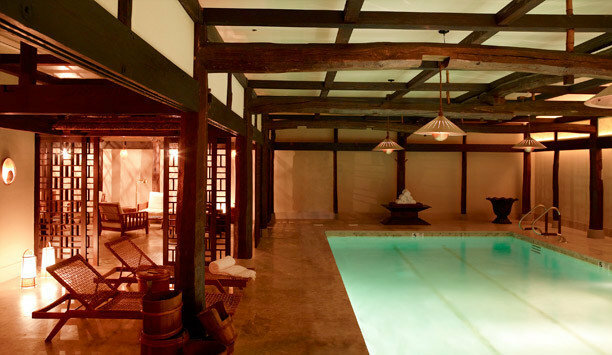 Check out the 10 most affordable New York City hotels (your wallet will thank you). From housing Titanic survivors to hosting Hedwig and the Angry Itch in the 80s, the Jane has carved its way into New York history books. Originally built in 1908 as a sailor's bunkhouse, it still flaunts a nautical vibe (guests choose between tiny bunks with shared bathrooms or upgraded Captain’s Cabins, complete with velvet drapery and peacock print wallpaper) but now has 21st-century attractions. There's the sceney Ballroom (where the fashion set converges after hours beneath maharaja portraits and a disco ball) and Old Rose, a seasonal Italian restaurant that's become a neighborhood staple for brunch. What did Yo! Sushi founder Simon Woodroffe get when he combined his love of airplane cabins with Japan’s pod hotels? YOTEL, a brand of capsule hotels at international airports. The New York location, however, is his first foray off the runway. Here, 669 cabins smack in the theater district are straight out of The Jetsons, with customizable backlighting, open bathrooms, motorized couches that become beds, and a “techno” wall to keep you plugged in at all times. The Asian bites at 4th-floor restaurant Dohyo are next-level (as is the vast, wraparound outdoor terrace), but the showstopper is surely the giant robotic arm on the ground level that deposits your luggage into lockers. The future is now, people. 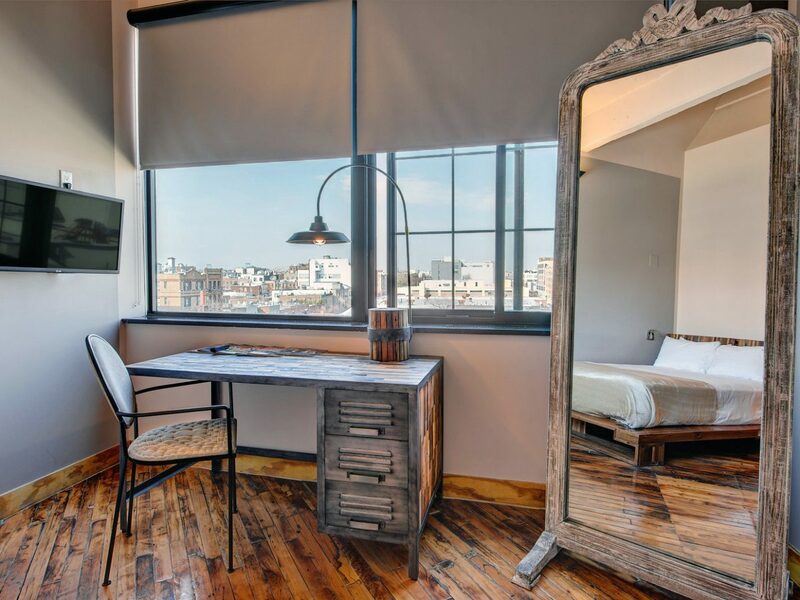 Joining the ranks of fellow factories turned hotels (see The Refinery in Midtown and Brooklyn's The Wythe), The Paper Factory in Long Island City also honors its industrial past—the original cement or wood floors and ceilings were left completely untouched. It all sets a monochromatic stage for serious pops of color and kitsch, like British phone booths in the lobby and sea-green mini-fridges in each loft-like guest room. The rest of the decor is a mashup of eclectic furniture that developer Gal Sela sourced from around the world (Vietnam, Morocco, India), all of which all comes to a head at Mundo, the clubby Latin-Mediterranean fusion restaurant that serves up excellent cocktails and live music. 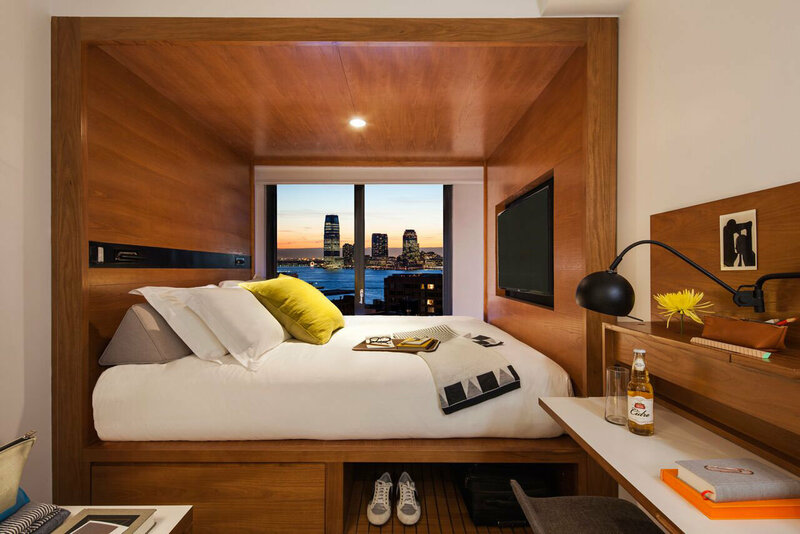 Budding hospitality brand Arlo is giving the rising micro-hotel trend an innovative twist. The concept: provide a gathering place for "urban explorers" looking to stay for a night, a week, or, in the case of its public-use spaces, just a few hours. The 325 stylish if tiny rooms (some are just the width of a bed) become a means to an end, but with a smart AvroKO design. 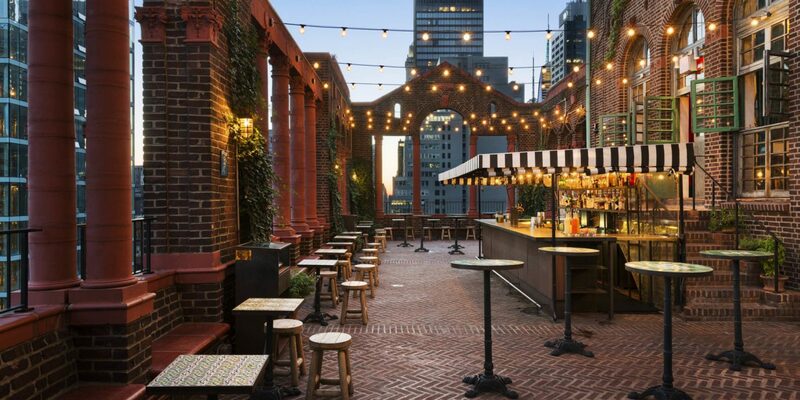 The multiple public spaces—including a rooftop terrace and patio and various tech-savvy lounges—encourage socializing and creativity, while a destination restaurant helmed by chef Harold Moore and pop-up events from fitness classes to art workshops ensure there's always something interesting going on—whether you're a paying guest or not. 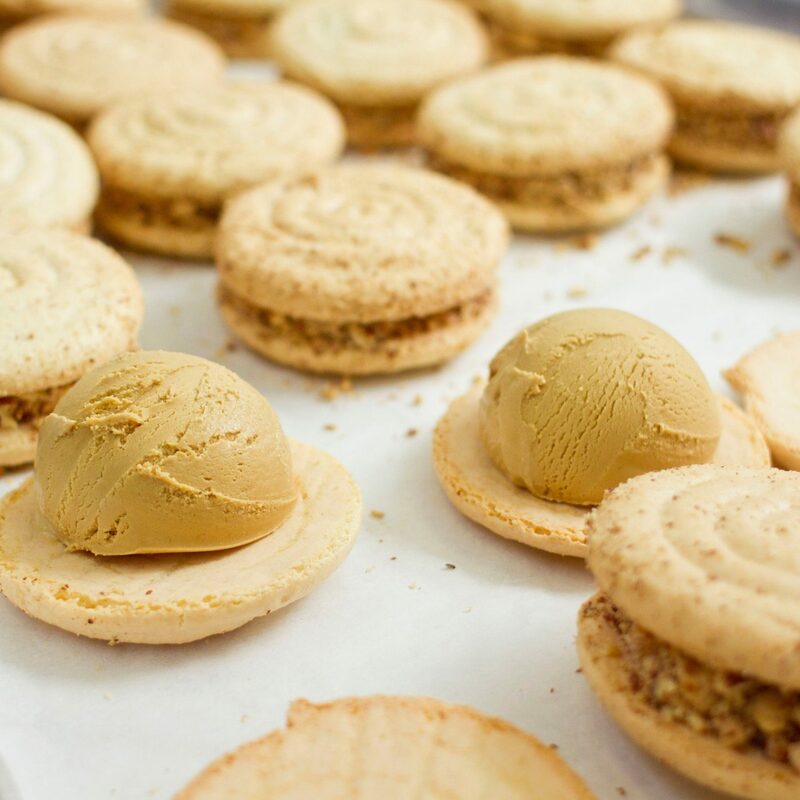 Next up: a second location in NoMad, expected this November. Steps from the Brooklyn Bridge, this downtown DUMBO boutique still manages to feel cozy despite its busy location. 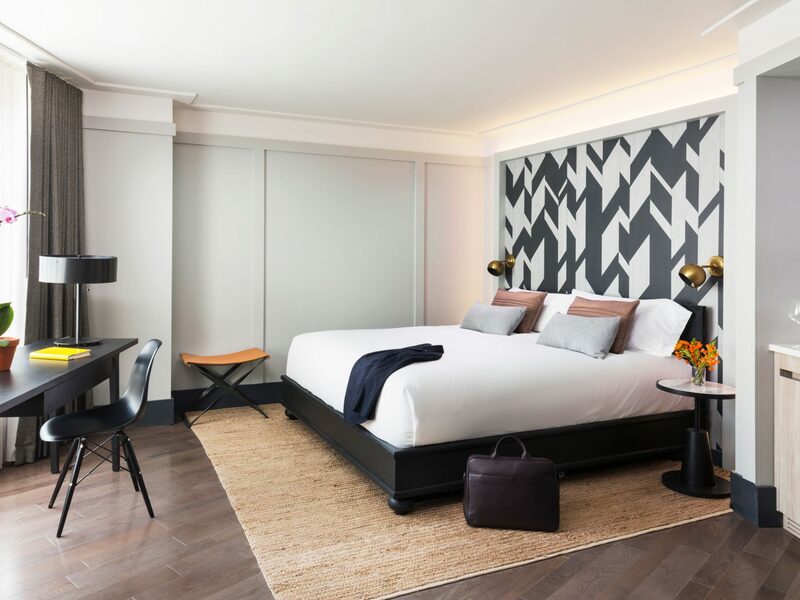 Courtesy of local design firm clo-th Interiors, the 174 moody yet stylish guest rooms (with their dark woods, graphic stenciled headboards, handwoven jute rugs, and a mishmash of grays) are more classic and modern than the name "dazzler" would have you expect. What we love best: the indoor-outdoor Beer Garden. This Times Square gem sports a sick look thanks to a head-to-toe redesign by David Rockwell. 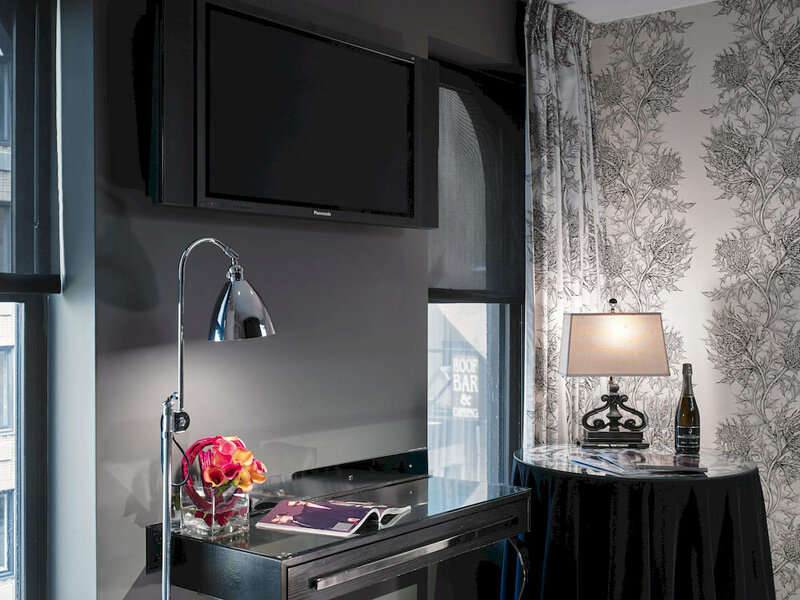 Industrial accents and metallic detailing dress up the public spaces, while the guest rooms have serious swagger with Italian Frette linens, slate bathrooms and Samsung Smart TVs covertly hidden in a circular statement mirror. Downstairs is the newest outpost of Serafina, a hip restaurant that serves creative takes on Italian classics (risotto with champagne and black truffles, shrimp sautéed in a creamy Cognac sauce). And for a late-night tipple, there's the swanky speakeasy-like lounge, LeGrande. It may sit in the shadow of the Chrysler Building, but it's rare not to find a crowd forming outside hipper than thou Pod 39. The big draws: Chef April Bloomfield and Ken Friedman's smash-hit taqueria Salvation Taco on the ground floor and the open-air rooftop courtyard, which dishes up empanadas and guac with skyscraper views. Meanwhile, the 366 compact rooms are an upscale take on your average hostel, featuring private baths (a welcome departure from the communal bathrooms at sister property Pod 51) and chic, space-saving design that keeps it simple. Is Queens the new Brooklyn? It’s getting harder and harder to turn a blind eye to (or keep count of) the quality restaurants and comedy clubs that keep opening there. 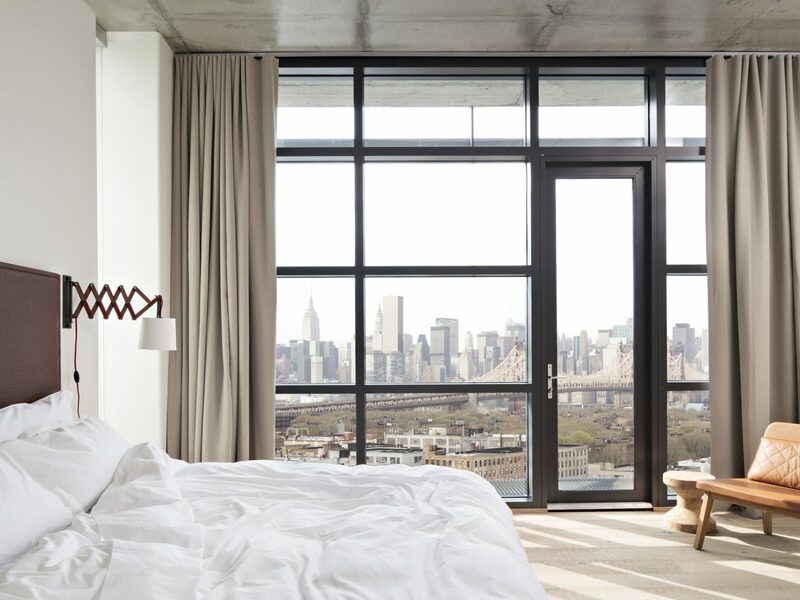 The clincher, however, might be The Boro Hotel, a design-forward boutique sleep just two blocks from the N and Q trains with knockout views of Midtown. 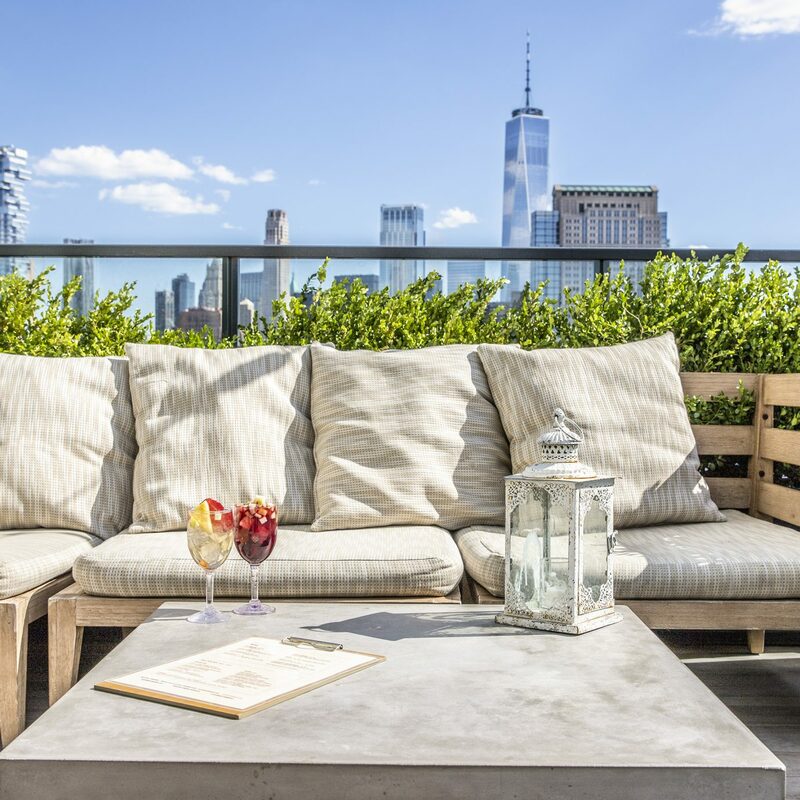 Most rooms have private terraces and attractive bathrooms with amenities from Greek cult brand Apivita, while the 360-degree panoramas from the rooftop bar make it easy to forget you’re in an outer borough. 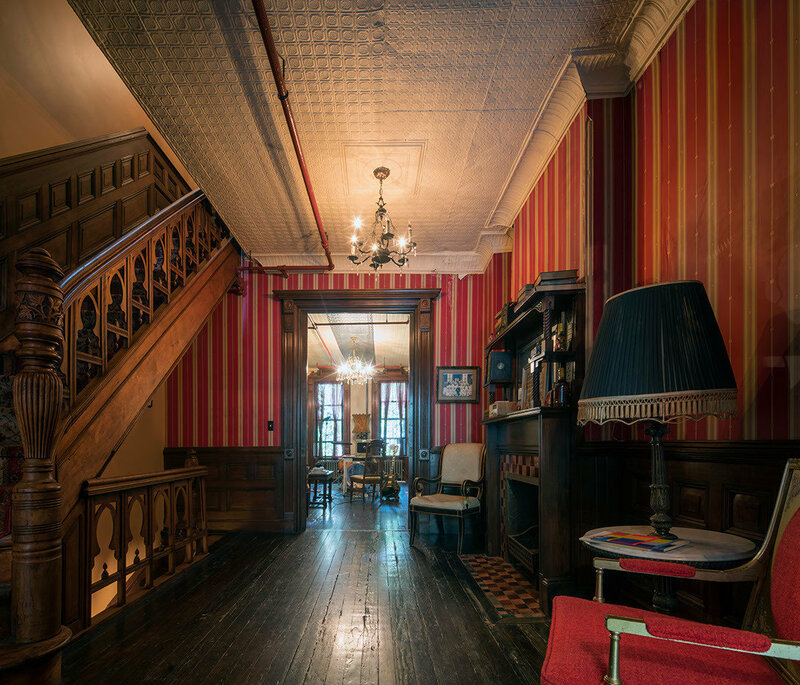 Harlem's Jazz Age lives on in this 1890s brownstone, where four floors have been restored to beautiful effect. 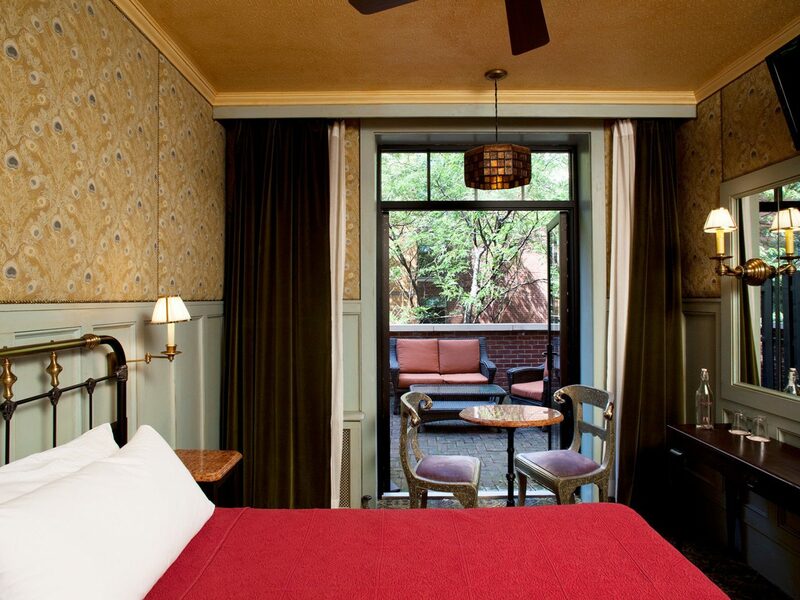 The four guest rooms, named after Harlem Renaissance figures like Corky Hale and Chester Himes, are kitted out with four-poster beds, antique cabinets, tin ceilings, and vintage radios (playing jazz, of course). You won't find air conditioners or TVs here, and bathrooms are shared per floor, but that just adds to the quirky, time-capsule charm. It's a stylishly spare affair at The Bernic, in Manhattan's Turtle Bay district. A glass-and-gunmetal facade gives way to even more glass in the 96 sleek rooms, which are outfitted with floor-to-ceiling windows, murals by blind contour artist Ian Sklarsky, Apple flat-screens, books curated by the Strand Bookstore, and, in some, glass-enclosed balconies from which to take in the buzz below. 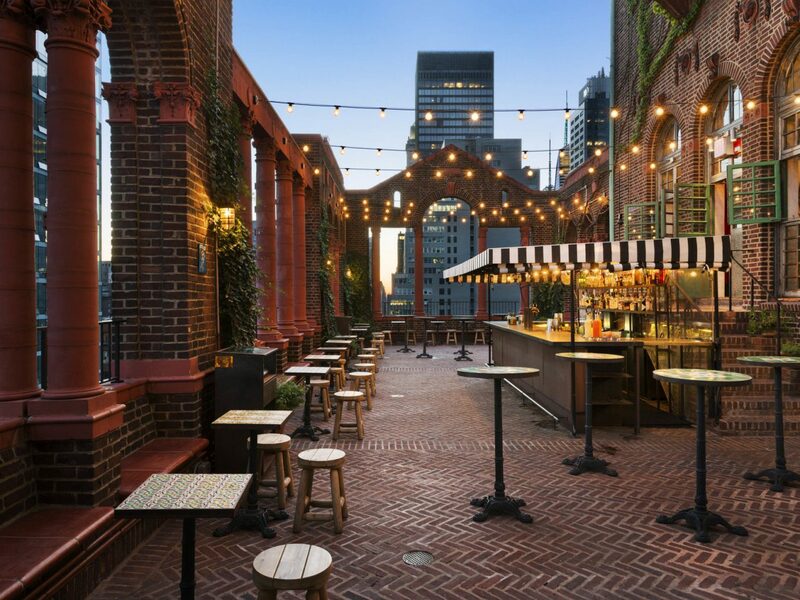 We love the rooftop sky lounge, but for many, the Bernic's location will be its best asset—the hotel is just steps away from Rockefeller Center and other landmark sites. Disclaimer: Rates fluctuate depending on availability and seasonality.